Press the square button for five times to turn on the battery, and then long press the square button to get a puff. Switch the VV/VW mode: Press the square button for three times to switch the VV/VW mode when the battery is turned on. Adjust the voltage/wattage: Press the plus or minus direction button to increase or decrease the voltage/wattage. The voltage is adjustable vary from 3.0V to 5.5V, and the wattage can be up to 20W. Long press the plus or minus direction button to enter the AUTO mode, increase or decrease voltage/wattage by 0.1V/W. Press the plus or minus direction button again, increase or decrease voltage/wattage by 0.2V/W. If still press the plus or minus direction button one more time, then increase or decrease voltage/wattage by 0.5V/W. Press the plus or minus direction button to choose the voltage/wattage you want. If you want to choose the voltage/wattage halfway, just press the opposite direction button to stop the increasing or decreasing voltage/wattage. Eleaf iStick is charged through USB port at the bottom. One can take puffs while it is being charged. Over 10s Protection: When you keep pressing the button for over 10 seconds, the output will shut off and the OLED screen will reflect “Over 10s”. Atomizer Short-circuit Protection: When atomizer short-circuit occurs, the OLED screen will reflect “Atomizer Short”. Low-voltage Protection: When the voltage of battery is below 3.3V, the OLED screen will reflect “Lock”. Unlock the Low-voltage Protection: When the voltage of battery is above 3.65V, the low-voltage protection will be unlocked. High-safety, high-capacity, high-magnification and high-stability lithium battery. On the top end of the battery, there are Eleaf branded logo silk-screen and CE marking laser. On the bottom of the battery, there are the branded laser and silk-screen, the significant symbols of Eleaf brand. a) Only have your iStick repaired by Eleaf. Do not attempt to repair the unit by yourself as damage or personal injury may occur. 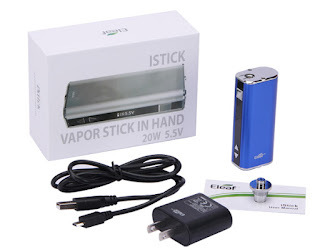 b) Do not leave the iStick in high temperatures or damp conditions, otherwise it may be damaged. The appropriate operation temperature is within 0℃to45℃ while charging and -10℃ to 60℃ while using.